British journalist David Higgerson has dished out some more praise for Mimi Johnson‘s Gathering String. This was the book which led to me starting 2013 with bags under my eyes. You know when you think you don’t have time to read, then start reading a book when you get chance and then everything else that can be put to one side tends to go that way? This is one of those books. 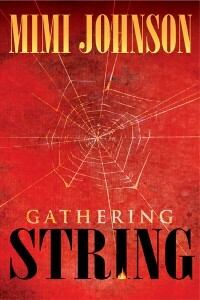 Gathering String author Mimi Johnson is making plans for an Iowa book tour to promote her novel. Details will come soon, but she has already scheduled her first two Iowa events. She will be in Iowa the week of Oct. 1-6. This is the ideal time and place for a Gathering String tour. Barely a month before this November’s election, an Iowa native will return to her home state to discuss her novel about the mystery surrounding an Iowa governor’s presidential campaign. Johnson grew up in Essex, Iowa, and has lived in Shenandoah, Des Moines and Cedar Rapids. She was a student at Iowa State University. Iowa bookstores, libraries, book clubs and journalists can email the author at mimi (dot) johnson (at) me (dot) com to schedule readings, interviews and book signings. The print edition of Gathering String is available in time for the Iowa book tour. The Kindle edition, published in March, has been downloaded more than 10,000 times. Thirteen of the book’s 18 Amazon reviews have given the book a top rating of five stars. Others praising Gathering String have been Tim McGuire, former president of the American Society of News Editors and now a journalism professor at the Walter Cronkite School of Journalism, Andrew Beaujon of the Poynter Institute, and authors Don Fry, Buffy Andrews and Richard Hine. Iowans praising the book have included journalists Rae Riebe and Brian Smith. The tour also could include a stop in Omaha, where Johnson studied creative writing at Creighton University. Readers have blamed Gathering String for neglected chores, sunburn on the beach and for sitting by an outlet to keep reading after an iPad’s battery ran down. Bring Mimi Johnson to your bookstore, library or book club, so your community can see why readers can’t put this book down. Johnson has an ear for sparkling dialogue and a flair for dramatic pacing. Her dry wit made me smile, and her portrayals of Iowa, small-town life and the nitty-gritty of the news media are spot-on. The action unfolds quickly in the last quarter of the novel. I can’t remember the last time I stayed up most of the night to finish a book. I highly recommend “Gathering String.” It is a good read, and a timely one, too. Not just because this is an election year, but also because the book explores journalism ethics in a 24/7 news cycle. 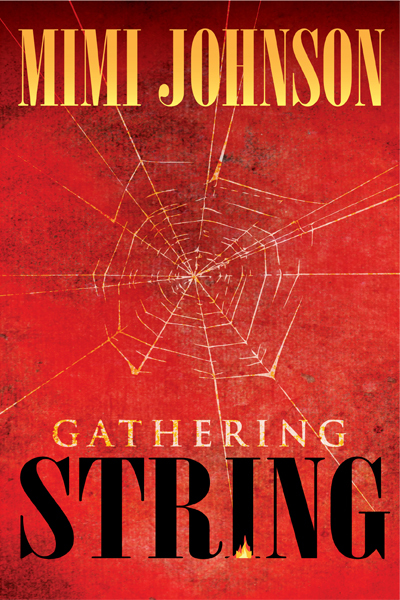 Mimi Johnson’s “Gathering String” is a finely crafted mystery and an intriguing study of complex relationships that you won’t want to put down until you’ve read it to the end. 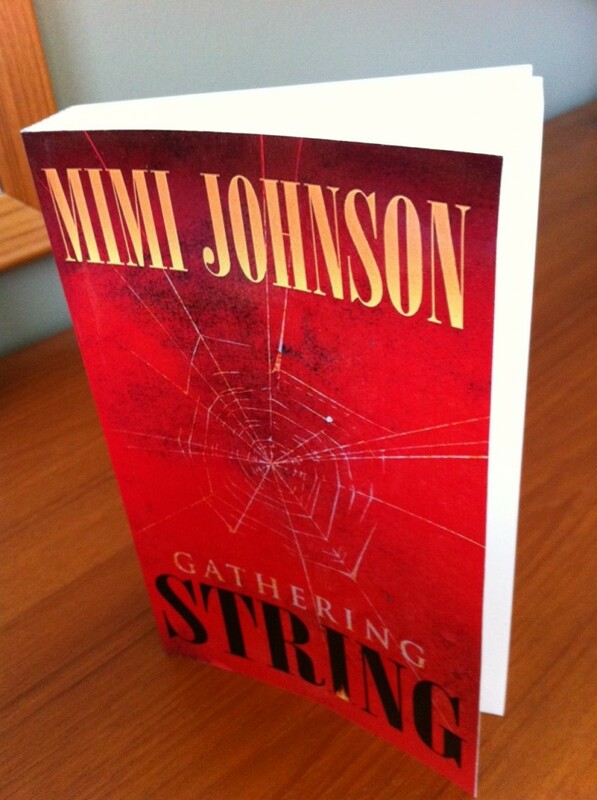 Gathering String is $5.99 on the Kindle Store. You can read it on the Kindle app for iPad, iPhone or computer if you don’t have a Kindle. A print edition will be coming out soon.